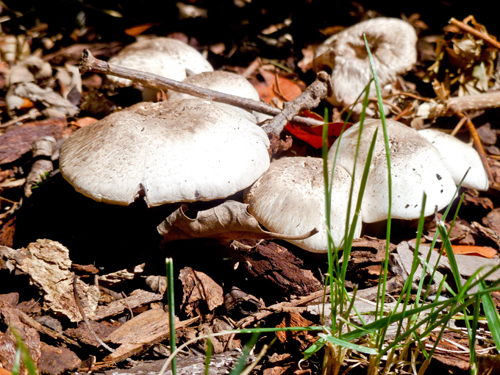 While playing in the yard the other day, the tot stumbled upon some mushrooms growing in a happy moist corner of the garden. Yeah, some “wild” mushrooms can be harmful if eaten or even touched, but, these were the safe kind – pretty much what you pick up at your grocery store. But, I wasn’t about to toss them in a sauté pan with some garlic. Nope. I had other plans for those mushrooms. We carefully picked the mushrooms and then went on a garden scavenger hunt searching out any others. We took our happy little discoveries upstairs and spent a little time taking a closer look at those mushrooms. These fleshy earthy flavored fungi are a favorite of many. And mushrooms aren’t just for slicing and dicing, they can create art too. Packed inside the delicate gills are tons of spores, which help propagate more mushrooms. And those spores can be turned into a really cool experiment with totally creative results. Hey, if you aren’t up for hunting for mushrooms in your neighborhood, just head to the grocery store and select a few nice big white button mushrooms. They’ll work just fine. After you’ve picked out your mushrooms, invite your child to investigate a little closer with the help of a magnifying glass. Maybe she’ll be able to see a few of those super small spores! After your child’s taken a nice long look, she can remove the stems of the mushrooms leaving just the nice round caps. Now she can place those mushrooms with the gill side facing down on a sheet of white paper. Help her find a nice spot to place them where they won’t be disturbed for several hours – overnight is perfect. 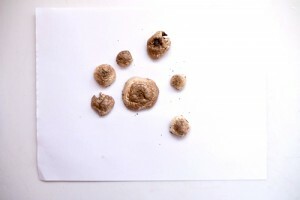 The next day, invite your child to remove the mushrooms from the paper and check out what has happened. Those spores all released from the mushroom and created a delicate print of the underside of the mushroom! She can cut out one of her favorites and glue onto a sheet of construction paper. 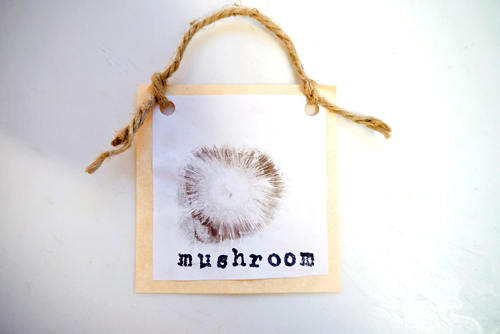 Then she can take things a bit further by writing out the word mushroom under the print in her own handwriting or by using letter stamps, popping two holes at the upper top corners, and then stringing with a length of twine. The spore print is really delicate, so encourage your child to avoid touching – otherwise everything will turn into a smudgy mess, and that’s no fun. You can help protect the print with a spritz of hairspray, which will help stick those spores to the paper. Now she can display the print in the kitchen for the whole family to enjoy! Oh, how interesting! I had no idea they could do that! I MUST try this!